Binoculars, such as these powerful “big eyes”, are used for visual sightings. Photo courtesy of Protected Resources Division, Southwest Fisheries Science Center, La Jolla, California (swfsc.nmfs.noaa.gov/PRD/)Visual observations of marine mammals made during large-scale surveys or associated with a specific research project can provide detailed information on the behavior, movement, and abundance of these animals in the wild. Scientists can compare baseline measurements obtained during “control” conditions to those obtained under experimental conditions, when sound is being transmitted. Changes in the animals’ behavior and/or abundance can be used to infer how the animals are affected by sound. Visual observations are most appropriate for cetacean and sirenian species, as these mammals must surface to breathe. Pinnipeds do come to the surface for air, but they are difficult to observe from a boat at sea. Visual observations of marine mammals made during large-scale surveys or associated with a specific research project can provide detailed information on the behavior, movement, and abundance of these animals in the wild. Scientists can compare baseline measurements obtained during “control” conditions to those obtained under experimental conditions, when sound is being transmitted. Changes in the animals’ behavior and/or abundance can be used to infer how the animals are affected by sound. Visual observations are most appropriate for cetacean and sirenian species, as these mammals must surface to breathe. Pinnipeds do come to the surface for air, but they are difficult to observe from a boat at seaGordon, J., Thompson, D., & Tyack, P. (2003). Proceedings of the workshop: The use of controlled exposure experiments to investigate the effects of noise on marine mammals: scientific, methodological, and practical considerations. European Cetacean Society Newsletter, No. 41–Special Issue Feb. 2003, 24.. 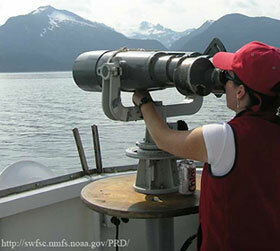 Visual observation studies involve trained observers that watch for marine animals of interest. The observers can be shipboard, in airplanes, or on land. For shipboard studies each observer is responsible for surveying a particular area of water on each side of the observation vessel. Binoculars are typically used to extend the visual range of observers, and night vision goggles can be used during hours of darkness. Once animals are spotted many things can occur. First, the number of animals present is estimated. Then, depending upon the goals of the project, animals can be photographed for photo-identification purposes, behavioral data can be recorded, and/or an individual animal can be followed for a period of time. When one animal is observed for a period of time, this is referred to as a focal follow. Whether one or many animals are being observed, typical behavioral observations include behavioral state (feeding, socializing, resting, etc. ), presence or absence of calves/pups, respiration rate, dive duration, and spacing or movement of animals. Visual observations can also be obtained from aerial surveys. During aerial surveys a small plane flies close to the water while trained observers count the number of animals that are spotted. Aerial surveys are useful in obtaining abundance estimates or observing shifts in distribution over a large area in a short amount of time. For example, aerial surveys were used to compare the number of humpback whales and their distribution within 40 km of the ATOC (Acoustic Thermometry of Ocean Climate) source in two years when the source was transmitting to a year when the source was offMobley, J. R. (2004). Results of 2004 Aerial Surveys of Humpback Whales North of Kauai. Annual Report Submitted to: North Pacific Acoustic Laboratory (NPAL) Program Scripps Institution of Oceanography. Report PDF Link. Aerial survey track lines (green dotted lines) for the 2004 North Pacific Acoustic Laboratory marine mammal monitoring effort off Kauai and Niihau, Hawaii. The blue dots represent humpback whale sightings from the aerial surveys. During the eight days of survey effort, 6,112 km of aerial survey lines were flown and 187 humpback whale sightings were recordedMobley, J. R. (2004). Results of 2004 Aerial Surveys of Humpback Whales North of Kauai. Annual Report Submitted to: North Pacific Acoustic Laboratory (NPAL) Program Scripps Institution of Oceanography. Report PDF Link. Image courtesy of Joe Mobley, Marine Mammal Research Consultants, Ltd.
Often, aerial surveys are conducted in conjunction with shipboard studies. The aerial team can direct the surface ship to animals for detailed studies, reducing the time and money devoted to long shipboard searches. Aerial surveys are a good method for collecting abundance and distribution data over a relatively large area. 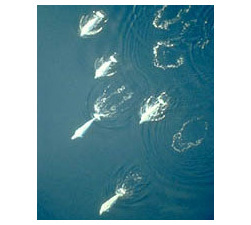 This aerial photograph of beluga whales swimming and creating wakes was taken by Robyn Angliss, NOAA National Marine Mammal Laboratory. 1. ↑ Gordon, J., Thompson, D., & Tyack, P. (2003). Proceedings of the workshop: The use of controlled exposure experiments to investigate the effects of noise on marine mammals: scientific, methodological, and practical considerations. European Cetacean Society Newsletter, No. 41–Special Issue Feb. 2003, 24.